This is the first of four articles about early Atlanta Pioneers Richard and Martha Todd, their family and remnant traces of their early presence in the Atlanta area. The second article is about the Todd cemetery, the third is about Todd Road, and the fourth is about the Burial Site of Patience Elizabeth (Todd) Armistead. It is generally accepted that Hardy Ivy and his family were the first people of European descent who settled in what is now the city of Atlanta. Hardy Ivy Park, at the intersection of Peachtree St. and Baker St. in downtown Atlanta memorializes this early pioneer. Not a trace of the Ivy homestead remains, and Hardy Ivy’s grave is lost and forgotten and most likely under a building southeast of the intersection of Courtland and Ellis Streets in downtown Atlanta. 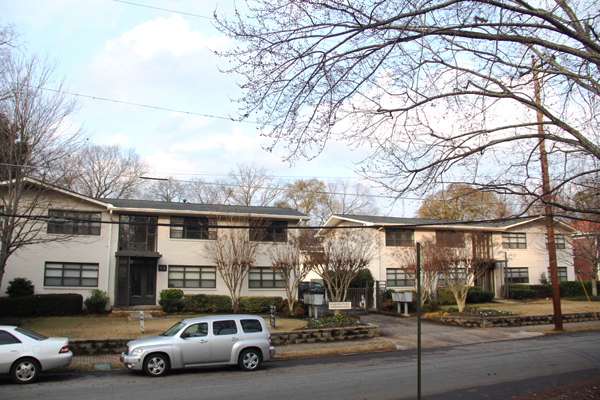 What is not generally known, however, is that there was an earlier settler whose family homestead was well within what is now the boundaries of contemporary in-town Atlanta. Traces of this family, the Todds, still exist today, including a unique burial monument in the back yard of an Atlanta residence (more on this monument in the second article of this series; be sure to check back in the next few weeks for this article). 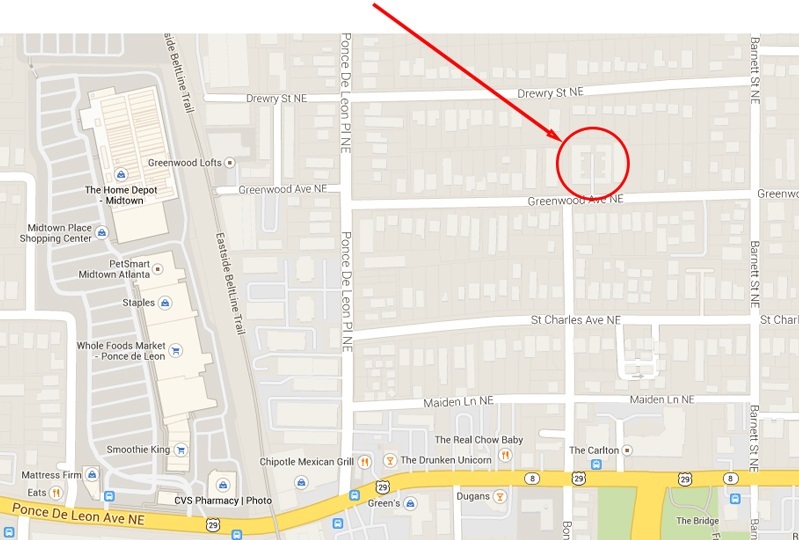 The fact that the location of Hardy Ivy’s grave is unknown is an unfortunate cultural loss. Certainly relatives and friends must have been aware of the grave for a generation or so after his death in 1842, but his grave marker, probably wood, must have eventually rotted away and disappeared, as did any recollection of the location of this Atlanta pioneer’s remains. Historical memory loss is all too common. 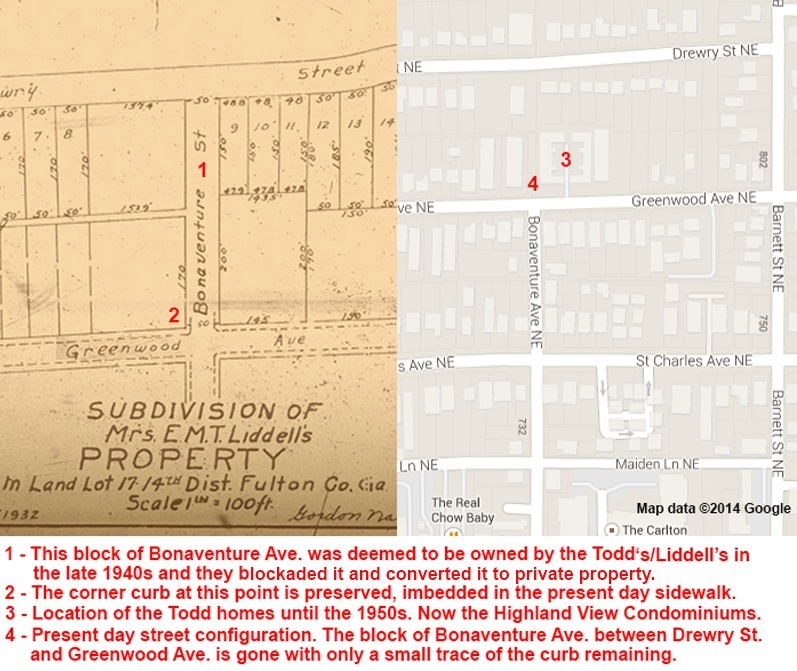 This article relies mostly on trace evidence of the Todd family’s presence in the Virginia-Highland neighborhood of Atlanta, but hopefully it will help keep the memory of the early Todd family from fading completely from our collective memory. The Todds are closely associated with Hardy Ivy. Hardy Ivy’s wife was Richard Todd’s older sister, Sarah Todd Ivy (1782-1886). Franklin Garrett in “Atlanta and Environs” Volume I, speculated that one possible site for Hardy Ivy’s grave was the Todd family cemetery. Todd Road, subject of the next article in this series, existed primarily to connect the Todd and Ivy homesteads. White settlement of the part of Georgia that includes Atlanta started in 1821 with a state lottery that awarded land lots of 202.5 acres to lottery winners. Prior to 1821 this land had belonged to the Creek Indians. Land lottery winners were called “fortunates” and had to be “free white males over 18,” except for soldiers, widows, and orphans for whom there were special rules. Fortunates paid the state $19 dollars to claim their land lots in the 1821 land lottery. It was in Georgia’s best interest to settle and populate former Indian lands ceded to the state, and the process of acquiring Indian land and distributing it to U.S. citizens was repeated multiple times, as Indian land was repeatedly ceded to the U.S. and Georgia, until eventually all Indians were evicted from their land in Georgia, as in other states as well. Richard Todd bought his land lot from William Zachary of Columbia County, Georgia, for $100 in 1822. This was common. Some men participated in the land lot lotteries simply to resell their lot at a profit. 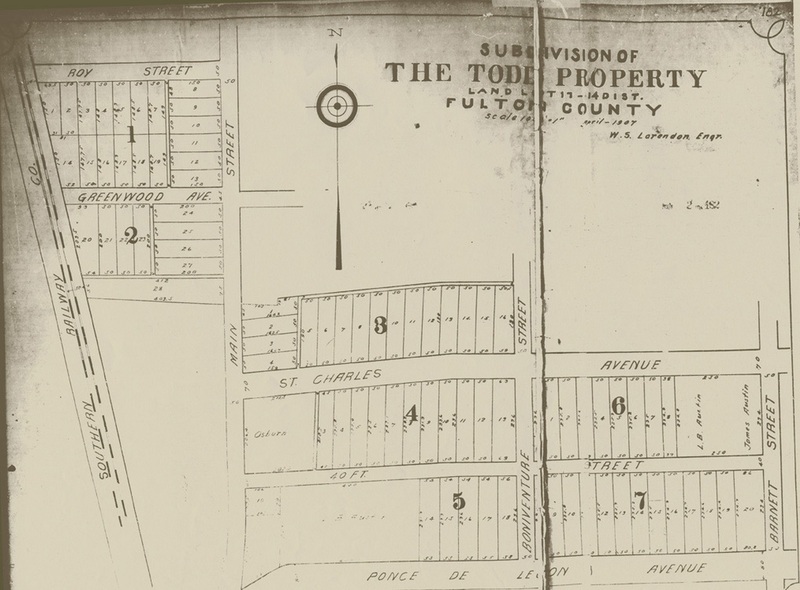 Todd’s lot was number 17, which covered most of today’s Virginia-Highland neighborhood from Adair Avenue south to North Avenue. 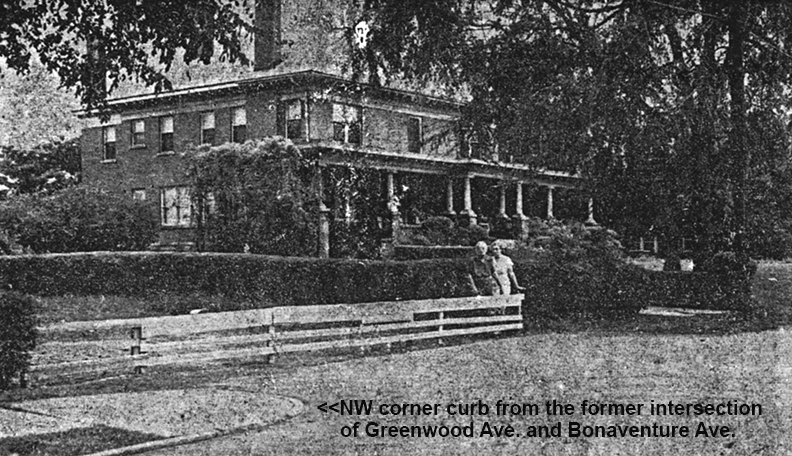 Shortly thereafter in 1823 he built a home for his growing family at what eventually became the street address of 816 Greenwood Avenue. 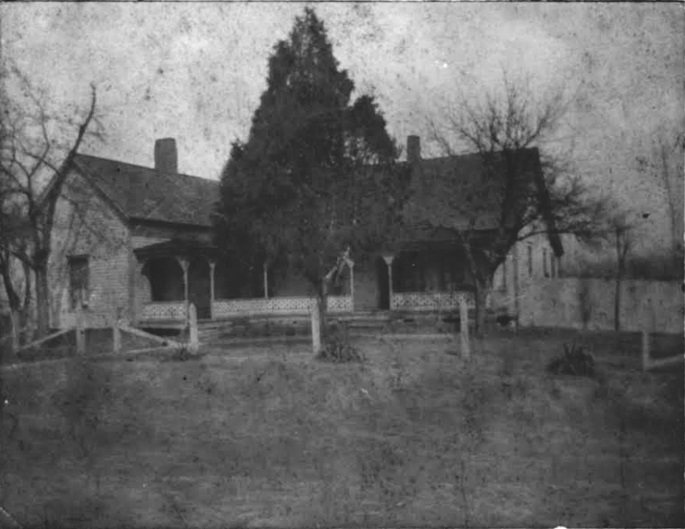 The original Todd homestead was established in 1823 ten years before Hardy Ivy built his homestead in 1833, but the Todd homestead was outside Atlanta’s early city limits so Hardy Ivy has been deemed by chroniclers to be Atlanta’s first settler. 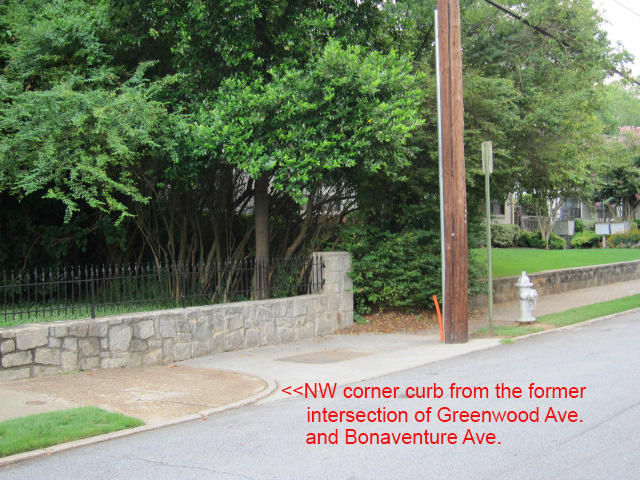 Today, the Virginia-Highland neighborhood is well within the Atlanta city limits so the Todds could be considered the first non-Indian settlers of Atlanta, if more representative city limit boundaries are taken into account. This is a photograph of the Todds’ first house built starting in about 1823. Four generations of Todds lived here until 1910, when it burned down. The next photograph, taken in the late 1940’s, also shows the wooden barrier erected by the Todd/Liddell family to keep traffic off of what was then a block of Bonaventure Ave. that connected this intersection to Drewry St., the next street over. The family members in the photograph below are Emma May Liddell and her daughter Ellen Liddell Morgan. Ms. Liddell successfully convinced city officials that this section of the road was actually her private property. The next photograph was taken recently from approximately the same angle and location as the 1949 photograph above. As you can see, the scene has totally changed, but there is a section of the corner curb from the 1949 photograph that is still imbedded in the sidewalk today. The Todd house was close to military action during siege of Atlanta in the Civil War. 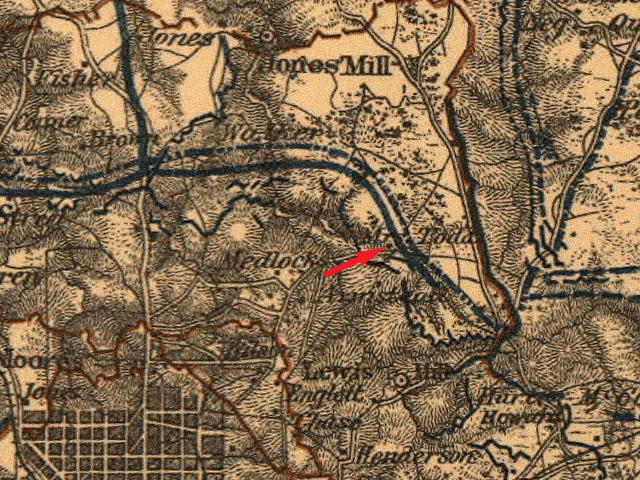 The blue lines in the Civil War era map below are Union army lines that surrounded Atlanta. Though a bit hard to see the house of “Mrs. Todd” is marked on this map. Although sources record the influx of “white” people onto former Indian land in Georgia, some number of African Americans must certainly have moved there as well, mostly as slaves, but possibly free African Americans. There is no record of the Todd family owning slaves, and that is reason enough to believe they were not slave holders, since slave ownership records were carefully maintained at the time. In contrast, there are records of the other early Atlanta pioneers, such as the Medlocks, owning slaves. 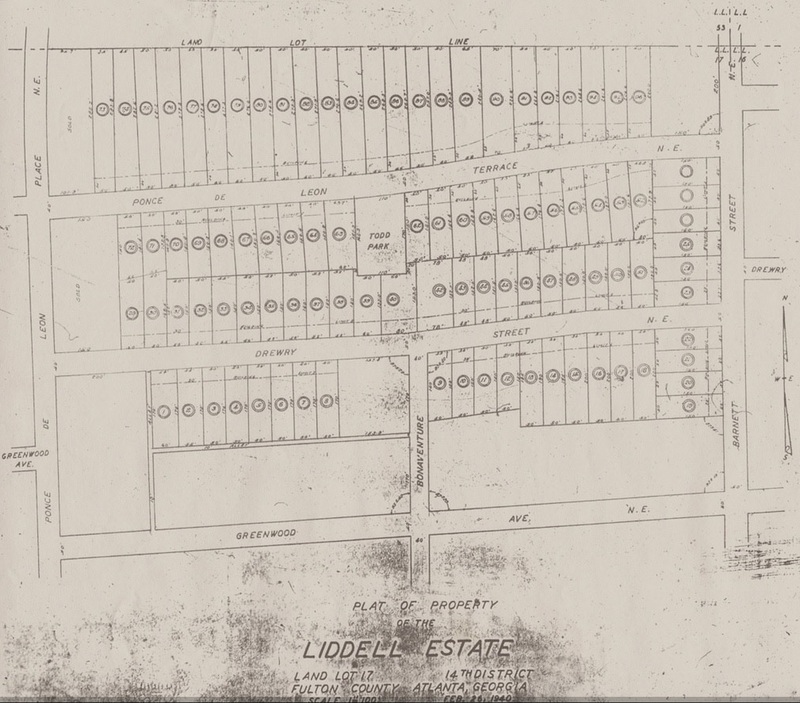 Sometime prior to 1932, by marriage and inheritance, the Todd property on Greenwood Ave. became property of the Liddell family. Records, such as burials at Rock Springs Presbyterian Church, show that the Liddell family flourished and there are descendants of the early Liddell family in the Atlanta area today—including Ramona Liddell and her son Rick Liddell, who provided material for this article. It is less clear what happened to the descendants of the Todd clan, except that many of the early Todds were buried in a cemetery not far from the Todd homestead. The second article in this series will focus on this oldest of Atlanta cemeteries and the unusual monument that marks its location today. Continue reading about the Todd Family in Ray Keen’s Todd Family Cemetery story, the second article in this series on these founding members of Virginia-Highland and Atlanta, or the third article Todd Road. Sources: “Atlanta and Environs” by Franklin Garrett, © 1954. “Virginia-Highland” by Karri Hobson-Page and Lola Carlisle, © 2011. “Atlanta’s Ponce de Leon Avenue” by Sharon Foster Jones. “History of Virginia-Highland” by Linda Merrill, a series of articles published in The Virginia-Highland Voice. Special thanks to the Atlanta History Center, Ramona Liddell, Rick Liddell, Andrew Wood, and Lola Carlisle for their contributions. The Erskine Memorial Fountain | Trio Laundry: Neglect or Incompetence?